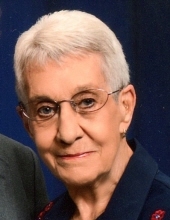 Bonnie Jean Cannon, 86, passed away, Saturday, March 30, 2019 at her home in Emporia. Bonnie Jean Horton was born June 22, 1932 in Neosho Rapids, Kansas, the daughter of Chester and Clara (Foley) Horton. She attended grade school and high school in Neosho Rapids. She graduated high school in the Class of 1950. She then attended Kansas State Teachers College in Emporia and graduated with Secretarial Degree in 1952. While in college, she became a member of Sigma Sigma Sigma Sorority. After college she was employed by Hegenbart & Grimwood Accounts. On May 22, 1955, she was joined in marriage to Donald E. Cannon at the First Congregational Church in Emporia. To this union in 1962, a son, D. Todd, was born. After marriage, she was employed by the Atchison, Topeka and Santa Fe Railway Company. She worked in the Superintendent’s office in Emporia for 31 years. Was then transferred to the Santa Fe Superintendent’s office in Kansas City, Kansas for 9 years before retiring in 1994, ending a 40 years career with the railroad. During their 63 years of marriage, she and her husband enjoyed traveling abroad, as well as, many cruises which included the Caribbean, Alaska and Panama Canal. She was a 60 plus year member of the First Congregational Church in Emporia. She a member of the alumni of Sigma Sigma Sigma Sorority, American Legion Auxillary Post 5, National Association of Retired and Veterans Railway Employees, Inc. and a past member of the Twin Ribers Chapter of the Sweet Adelines. Was also a long time fan of University of Kansas Basketball. Bonnie will be forever remembered by her husband, Donald; a sister-in-law, Eileen Thronton of Hartford; three nephews and a niece and countless friends. She was preceded in death by her parents; a son, D. Todd in 2011 and two brothers. A Graveside Memorial Service will be held at 2:00 p.m., Wednesday, April 3, 2019 at Lincoln Cemetery in Lebo. In lieu of flowers, the family request memorials to SOS or Granada Theater may be sent in care of Jones VanArsdale Funeral Home, PO Box 42, Lebo, KS 66856. Condolences may be expressed at Vanarsdalefs.com. To send flowers or a remembrance gift to the family of Bonnie Jean Cannon, please visit our Tribute Store. "Email Address" would like to share the life celebration of Bonnie Jean Cannon. Click on the "link" to go to share a favorite memory or leave a condolence message for the family.